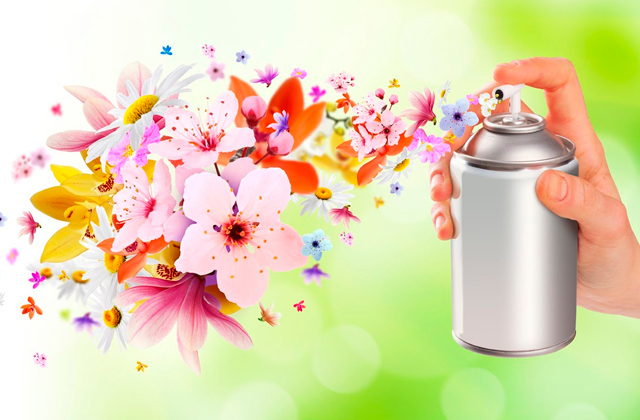 The plant-based power green technology is a combination of essential oils and partially synthetic ingredients that will effectively combat ground-in stains and mineral deposits. The scent is rather herbal than eucalyptus. 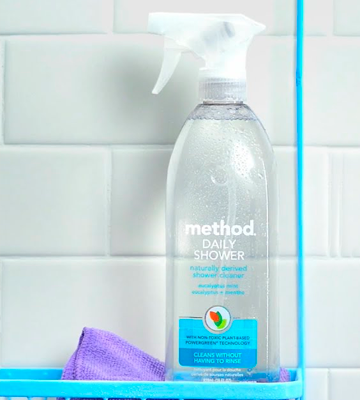 The Method Daily shower spray will do all the "dirty" work for you. Without the need to wipe it down, the cleaner will remove both soapy stripes and mildew. 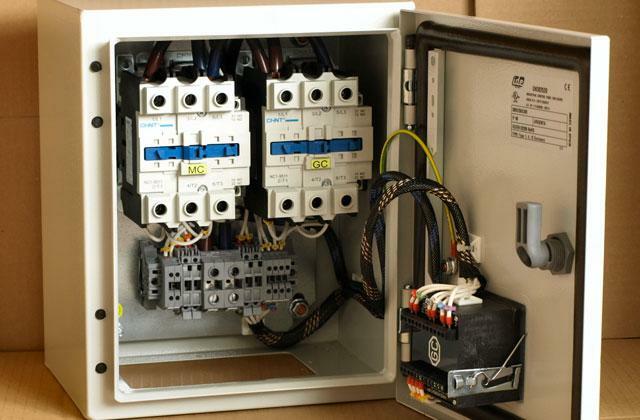 And subject to regular use, it will effectively prevent scale buildup and mold growth. The U.S. EPA Safer Choice certified, the product contains no harmful compounds and its active formula is based on all-natural ingredients. It's a biodegradable cleaner safe for you and for the environment. It might leave a greasy film on the surface in case you apply an excess amount. The Ecos shower cleaner is an eco-friendly and highly efficient product to eliminate lime deposits, mold, fungi, and hard water marks. 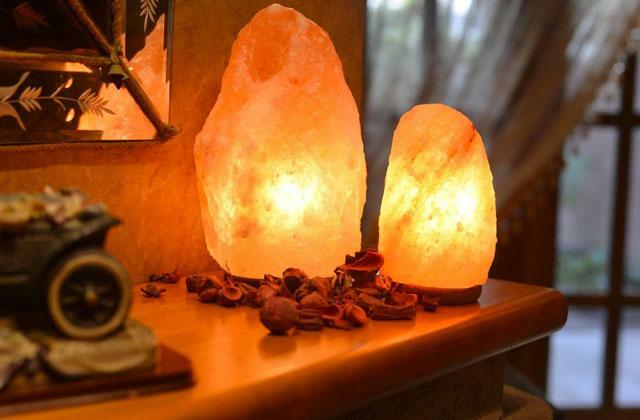 Easy-to-use and nice smelling, it will let you benefit from natural care. The product was not tested on animals. 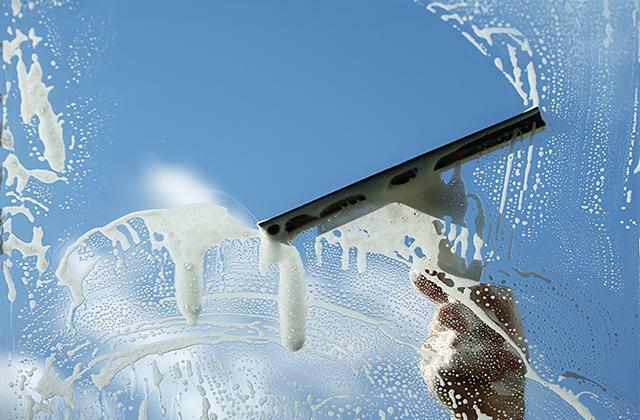 To clean the surface, it's enough to spray a bit of spray and leave it there for a few minutes. 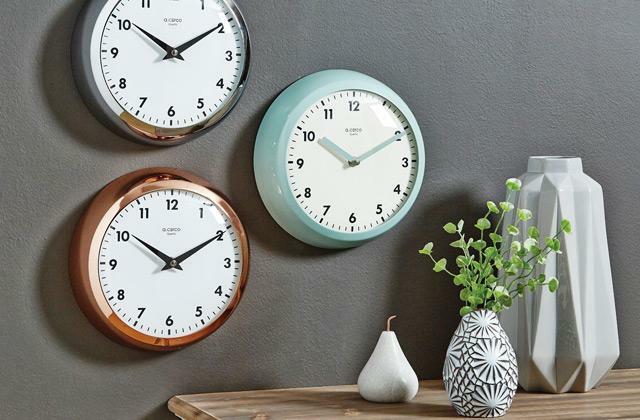 As a result, the grime will take off, and you'll have no stains or stripes to scrub and wipe down. Might cause irritation to sensitive eyes. Spray at a distance. 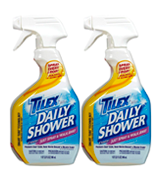 The Tilex shower spray is a must-have for any home. Used daily after shower, it will shield your bath or shower cube from grime, soap, and bacteria build-up and keep it pristine clean. Besides, bottles with sprayers use a solution more sparingly and last longer. Disinfecting qualities of the main ingredient, hydrogen peroxide, allow eliminating up to 99.99% of all moisture induced germs and bacteria in the bathroom. The scent can seem a bit harsh. 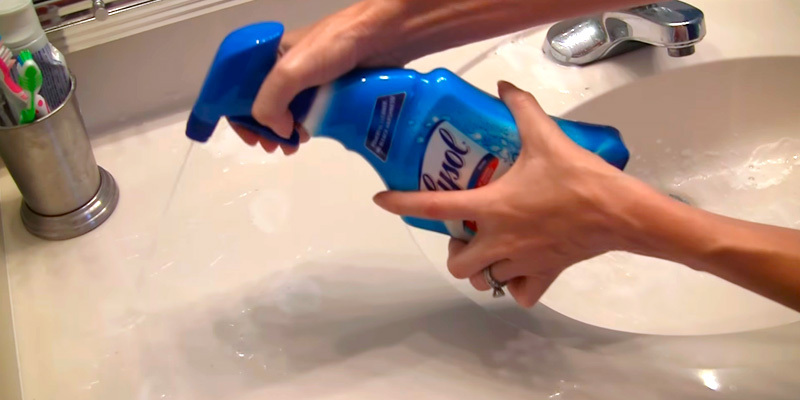 The Lysol is a great no-bleach alternative to deep cleaning and disinfection of extensively used bath surfaces including tile, a sink, shower, bathtub, toilet, and water taps. Safe in use, it needs no face masks or protective gloves when applied. It works gently, yet efficiently. Safe and extremely easy-to-use cleaning detergent which you can apply on a daily basis without damaging the surfaces or doing any harm to your health. It's not the best option for old-time deposits and ground-in stains. If you seek a budget-friendly basic cleaner for your daily needs, this product will fit the bill just right. Its scrub-free and no-rinse formula is suitable for all bathroom surfaces including metal taps and glass shower doors. It will keep your bathroom clean and freshly scented. 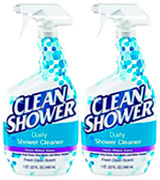 Today, there is an abundance of different shower cleaners on the market. And while all of them fall into pretty much the same price range, the effect they provide is varied, depending on the formula applied. Some producers go for mixes of active chemicals, others look for more natural and less harsh alternatives. Some combine both, exactly what the Method did. 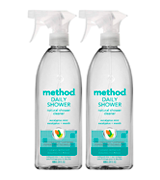 The formula of the Method shower cleaner is based on the composition of both natural and chemical components which allows it to effectively combat all sorts of shower contamination, and plant-based power green technology, combining essential oils and partially synthetic ingredients to remove ground-in dirt and solid mineral deposits that you'd be struggling scrubbing off by hand. 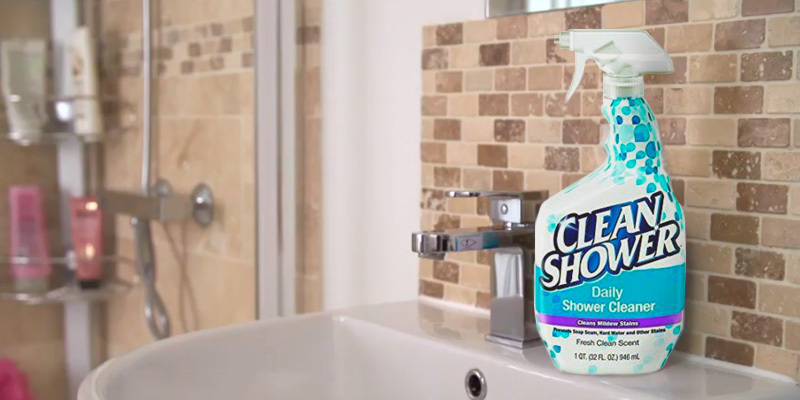 When applied, the Method shower cleaner leaves no chemical fumes or smells. All you will feel is a nice scent lingering in the air. 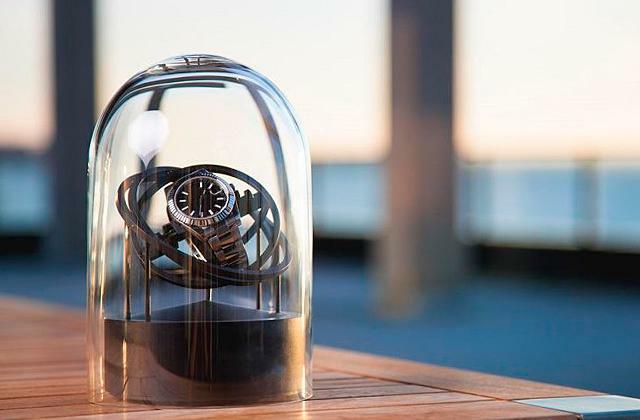 Moreover, you can even choose what smell you want it to have selecting from the variety of available options which include eucalyptus mint, almond, bathroom mint, clementine, fresh lavender, glass mint, and grapefruit. The detergent is safe for all sorts of non-porous surfaces and needs no rinsing or wiping. Although it won't do miracles from the very first time, in several applications it will loosen existing scum and limescale and make your walls much more resistant to the appearance of soapy deposits and grime in the long run. Besides, you’ll get a bundle of two 28-oz bottles, so you won’t need to buy a new cleaner too soon. Among a variety of chemical cleaners, the Method stands out for a well-thought and a kind innovative formula created to help you keep your bathroom space clean and fresh with less elbow grease and time spent. A strong modern trend of healthy lifestyle entangles using predominantly organic and natural products in all spheres, be it food, beauty products or household detergents. 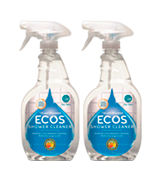 If you are into that healthy stream, the Ecos shower cleaner is for you. 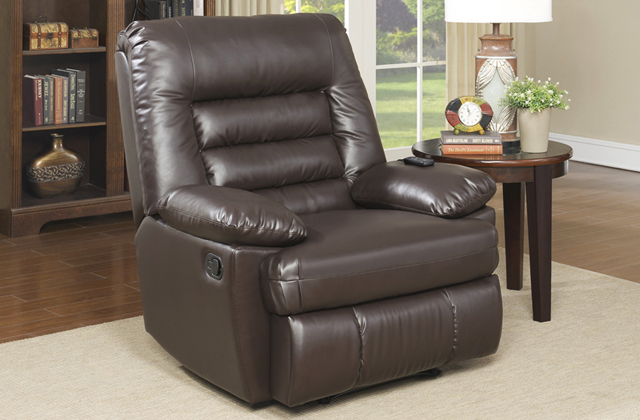 The product is U.S. EPA Safer Choice certified, which means it meets the strictest quality and safety standards. It contains no harmful or toxic ingredients, no dyes, parabens, phthalates or phosphates as well as it is free from animal ingredients and was never tested on animals. Instead, its organic content includes tea tree and lavender oils and aloe vera juice to deliver the plant goodness, add cleaning power, and fill the air with a pleasant natural scent. 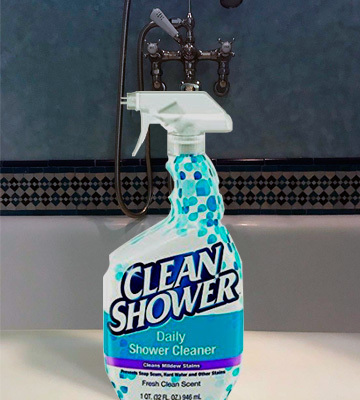 Featuring a pH balanced active formula, this no-scrub shower cleaner can be safely used on glass, tile, ceramics, metal fixtures and even natural stone. 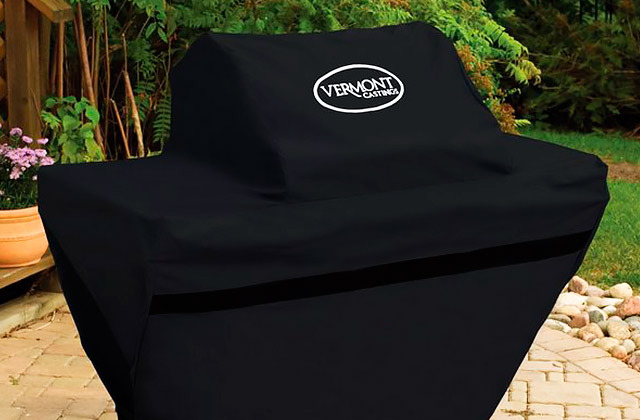 It causes no oxidation or damage to the surface material, yet, it efficiently prevents water spots, mold, and mildew. Simply spray it regularly over moist surfaces, and you’ll have no need to deep clean your bathroom all that often - it will sparkle and stay grime-free. 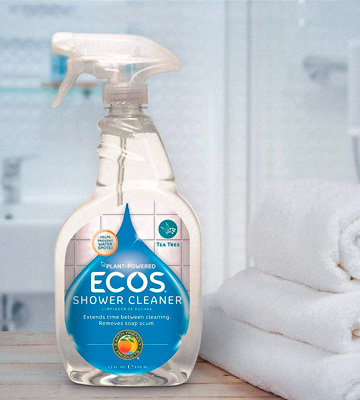 If you are a kind of environmentalist giving preference to eco-friendly products, you’ll be hard-pressed to find a better shower and tub cleaner than the Ecos. 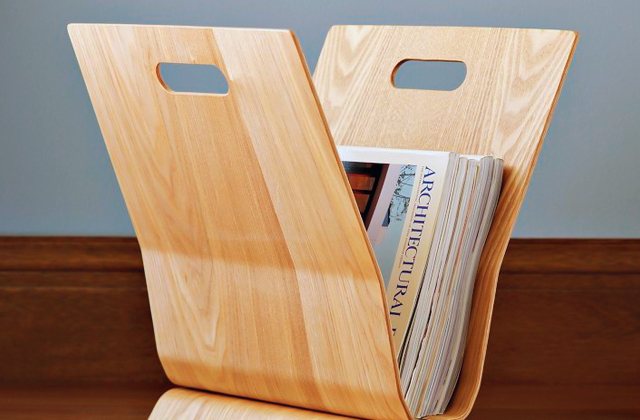 Effective against contamination, this biodegradable product is safe for you and for the environment. If you’ve ever visited a SPA or had a chance to spend a night in a luxury hotel, you can’t but notice the perfect cleanness of the bathroom surfaces and a gentle perfumed fragrance floating around. And you couldn’t help wondering how they manage to keep that neatness and tidiness in a public place while it takes you so much time and effort to maintain a single household bathroom in a clean condition. Most likely than not, the secret is very simple. It’s a good and functional shower cleaner like the one from Tilex. Spray and walk away. With Tilex, that’s all you'll have to do. No need to apply it and scrub afterward, no need to rinse and wipe it down. With no corrosive or toxic chemicals in its formula, this shower and bathtub cleaner will create a protective barrier on the surface to avert bacterial growth, limescale formation, and soap deposits. It works gently, yet effectively, and can be safely used on tile and glass, metal and chrome fixtures as well as on acrylic and plastic surfaces. In addition to the strong cleaning power, the product will fill the air with a nice scent, reminding the freshness of the sea breeze. Meanwhile, sprayer-fitted bottles minimize the liquid consumption and two 32-oz bottles you’ll get will last long enough. 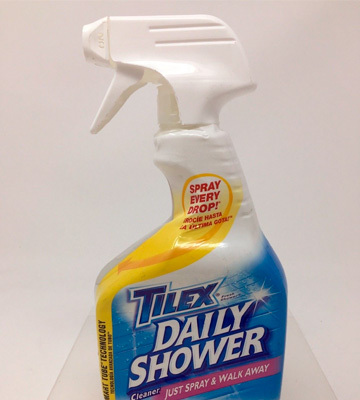 In short, if you want to enjoy SPA-like cleanness of your home bathroom without putting in much effort, the Tilex shower spray will definitely make a helpful addition to your household cleaning arsenal. No doubt, soap scum and limescale marks and strips caused by hard water abundant in mineral salts look unpleasant and give a feeling that you don’t clean your bathroom in a proper way. However, these spots are more or less harmless, while grime and moisture induced black mold can become a real threat to human health. It can cause a number of respiratory diseases and even damage your immune system. And it is easier to prevent its growth than try to get rid of it. This is where the Lysol shower cleaner come in. 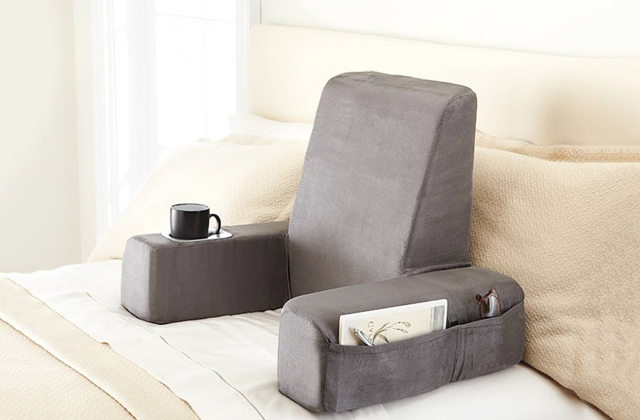 The product is a heavy-duty mold buster. 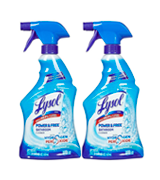 But, unlike many other caustic bleach-based detergents exuding acrid chlorine smell and requiring some special gear to be used during application, the Lysol is absolutely safe in use. It is all about the product formula including hydrogen peroxide. With a 0% bleach content, it delivers impressively strong cleaning power that kills 99.99% of all viruses, germs, and bacteria. Besides, there is no need for you to use any protective face masks or gloves to apply the cleaner. More than that, you don’t have to wash it down. 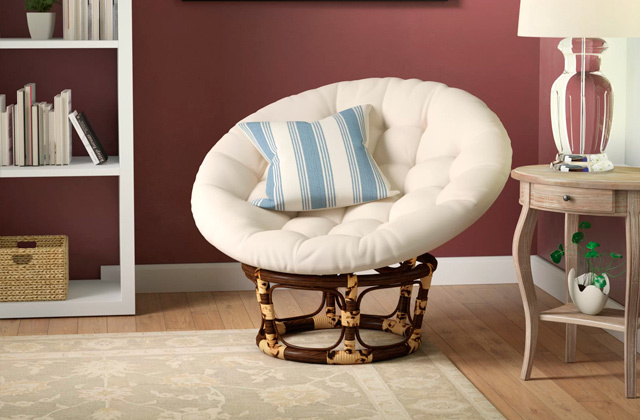 Once the liquid is applied on the surface, thousands of tiny bubbles are released to remove stains and dissolve grime. 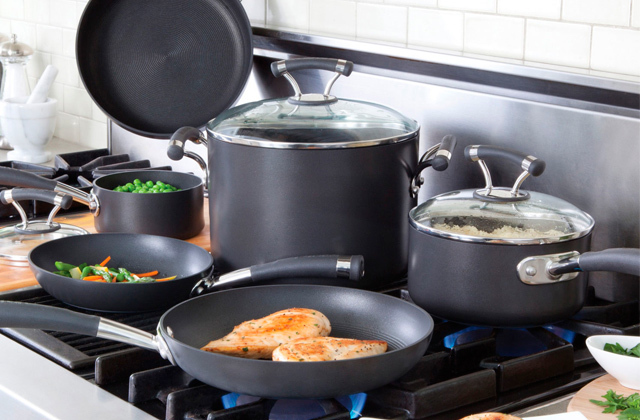 To get a better effect, you can rinse down the cleaner and apply it once again to an already clean surface to prevent bacterial growth and grease. As active as it is, the product can be used on all types of non-porous surfaces including glazed tile. 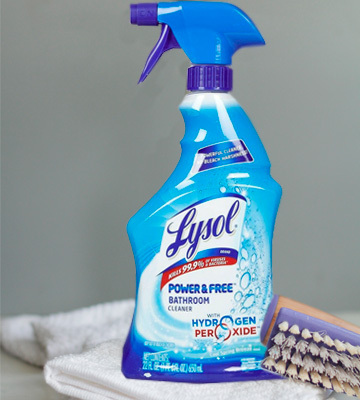 To conclude, infused with the power of hydrogen peroxide, the Lysol boasts great disinfecting qualities and makes a perfect no-bleach alternative to combat grime and limescale in such extensively used bathroom surfaces as tile walls and floors, a sink, bathtub, shower doors, toilet, and water taps. How do you build your arsenal of household detergents? Great chances are that you pick bottles with catchy names and bright labels randomly. If that's the case, you risk ending up using a wrong detergent that is not meant for the job at hand. In order to achieve great results, especially if you need to clean bathroom surfaces, it's essential to use the right cleaner. And if you aren't sure which one to choose from a range of available products, choose the Clean Daily Shower scrub-free spray - with this one, you'll never go wrong. The Clean Shower scrub-free spray is a basic preventive detergent used to keep mildew, soap resides, limescale and grease away from shower walls, shower floor and doors, tiles, a sink, and a bathtub. Its liquid formula contains no bleach, phthalates, phosphates or any other harsh chemicals that can damage the surface and do harm to your health. Whether you have a porcelain tub or a plastic shower stall, the cleaner will work equally efficiently on different types of materials and leave your glass, ceramic, and acrylic bathroom surfaces clean and sparkling. Similar to other products of this kind, the substance needs neither rinsing nor wiping. Just spray a delicate mist over the surface and let it do its job. The detergent goes deep in the stains to dissolve them and creates an invisible film to prevent the appearance of new stains and dirt. Also, it smells wonderful, keeping shower clean with a fresh scent. Summing up, the Clean Shower scrub-free spray is an excellent product for daily use to maintain your shower and bath neat and spotless in between deep cleans. It will safeguard the surfaces from mildew and greasy spots and make the unpleasant chore of bathroom cleaning a breeze. What Is a Shower Cleaner? Of all rooms, bathroom is the one we use most often. And, let's be honest, the one that is most difficult to clean. No matter what you have, a shower cube, bath, or maybe both, there are a lot of surfaces to clean. Take any of them - tile walls, glass shower doors, bath curtains, shower heads, taps and mirrors, they all need regular and thorough care. Constantly being in contact with water and steam, bathroom surfaces literally attract grime and mildew, to say nothing about soap and limescale marks that tend to appear on the glass and mold, thriving in the corners of the shower. To get rid of those and enjoy a sparkling clean bathroom, a lot of cleaning must be done, such as squeegeeing, sponging, rubbing, scrubbing, and scouring. However, we know a simpler solution. 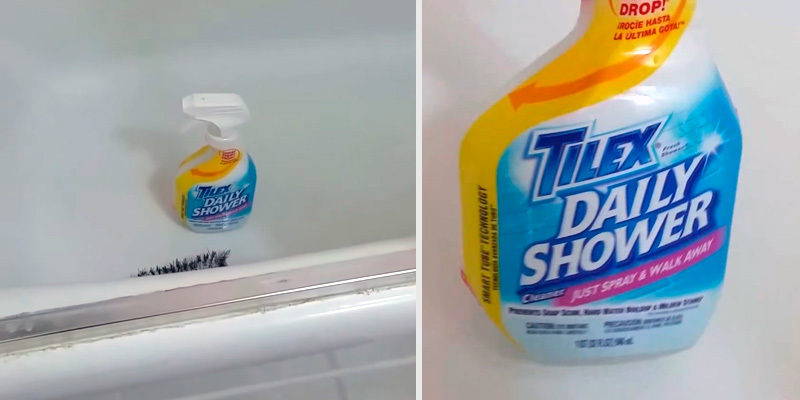 A shower cleaner (or a shower spray) is a simple, yet very effective detergent that will relieve you of those tiresome and boring cleaning chores. This product is designed for frequent use so that you can maintain your bathroom fresh and shining in between deep cleans. 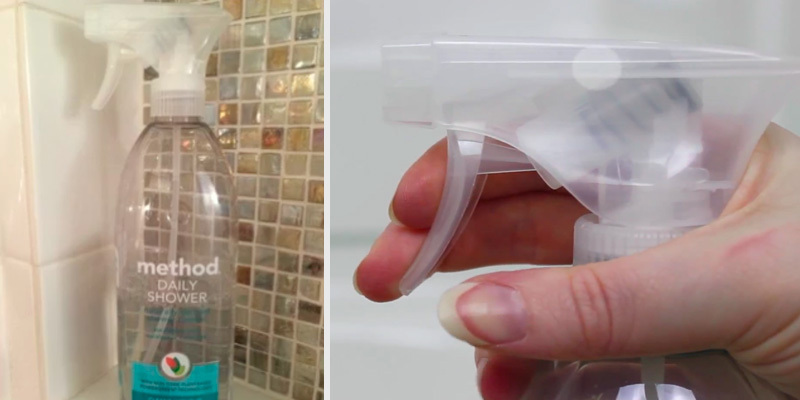 Normally, shower cleaners come in spray bottles and need no rinsing. They have safe formulas exuding no harmful vapors and are intended to prevent scum and mineral deposits formation. With a shower spray, you will need to deep clean less often, while your bathroom will look good and smell good. To further facilitate your household cleaning routines, we recommend reading our best dish soaps, carpet cleaners, and brooms reviews.